The Ford Explorer debuted in 1990 as a replacement model for the Bronco II. It is often credited with beginning the family SUV craze. This vehicle was highly popular from the outset and remains one of Ford Motor Company's top sellers today. 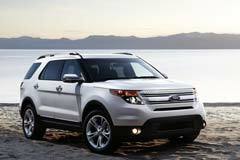 Used Ford Explorers have the style, size and utility to accommodate many different lifestyles. It is also an alternative to the minivan for a family. In 1990 and 1991 only two body styles were offered. Since then, more choices have become available. On the pre-owned market you will find the XLS, XLT, Limited and Eddie Bauer editions, each with its own upgrades. A used Ford Explorer will most often have 2 engine choices. The first is a 210HP, V6 and the other a 4.6 liter, 239HP, V8. Both motors were mated to a 5 speed automatic transmission. After 2006 a 292HP V8 was made available. The 8 cylinders are all but mandatory if you will be using the Ford Explorer for towing. A used Ford Explorer is a smart choice for both sportsmen and families. It affords its passengers an excellent ride and the driver superb handling. The cabin is roomy and there is plenty of cargo space as well.